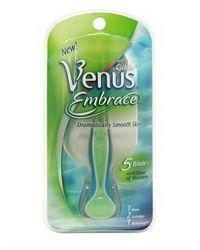 Women are finally catching up to men when it comes to shaving technology – as Gillette have just launched the first five blade razor for women, the Venus Embrace. The five blades, instead of the usual three means that hopefully you won’t need to keep going over those tricky bits, and there’s a protective Ribbon Moisture strip on either side of the blades to stop skin drying out. As well as that, Gillette have improved the handle, so it’s almost impossible for it to slip out of your hand. There’s also a new shaving gel to go with it – Satin Care Avacado Twist. Avacados are renowned for being and excellent source of moisture, so it’s perfect to keep skin soft and hydrated. You can get Gillette’s new products from Boots online and in stores nationwide now.